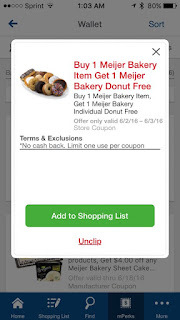 Meijer: Buy 1 Meijer bakery item get 1 FREE Bakery Donut mPerks coupon! There is this new mPerks coupon, buy 1 Meijer bakery item and get 1 Meijer bakery donut FREE! YUMMY!